Salamanders are some of the most amazing creatures on earth. When full grown they can be as small as 0.6 inches (1.7 cm) or as long as 6 feet (1.8 m). Some grow to be nearly 140 pounds (63 kg)! However most are around 6 inches (15 cm) long. They live all over the world and there are about 600 known species. One species has no legs and looks like a giant worm. Newts, mudpuppies, and sirens are all considered salamanders. There are two important aspects that set salamanders apart from other animals. These two things offer an important lesson for us as Christians. The first is that they must live very close to water to keep their skin moist and to reproduce. Jesus said that he is the water of life and we must live close to this Water in order to survive. The second and perhaps most unique aspect of salamanders is that they are able to lose and regrow their limbs. This is a defense mechanism that allows them to escape when under attack. This is similar to what Jesus meant when he said whoever wants to save his life will lose it. In order to save our life and have eternal life, we must be willing to sacrifice our old life. By old life Jesus meant our old habits and thoughts. It may seem like giving up a whole limb when we leave that old life behind, but Jesus promised to give us a better one in its place and it will be worth it! What does it mean to lose or give up your old life? Doesn’t Jesus want us to have fun? Can we still have fun with this ‘new life’? What if I have accepted Jesus’ new life but my life hasn’t really changed, it doesn’t feel better? 1. Alina Bradford. Facts About Salamanders. 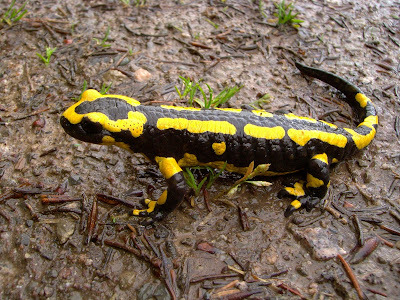 October 29, 2015 Accessed July 31, 2018 from https://www.livescience.com/52627-salamanders.html.